For safe railway operation, NDT (Non-Destructive detection Technology) detecting various rail defects is spotlighted for over a century. Along with recent development of highspeed railway system, more accurate, faster and digitized NDE (Non-Destructive Evaluation) technologies are required. railway compare to other industrial fields. 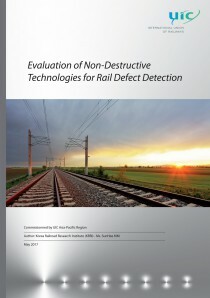 In this research, we overview types of rail defects with applicable NDE technologies. Also selected NDE technologies will be applied to frequent rail defects to identify requirements and limitation on rail-defects detection system. Not only conventional rail-applied-NDT devices (ultrasound, magnetic methods etc.) but also recently introduced optical NDT such as OCT and OFDI in medical field has been applied for rail surface scanning to evaluate a possibility for rail-defect detection. Therefore, this project report will cover several NDE technologies applying on frequent rail defects to understand what kind of NDE technology is more adequate for different rail defect types.